We are proud to announce the formation of Eternal Knights! 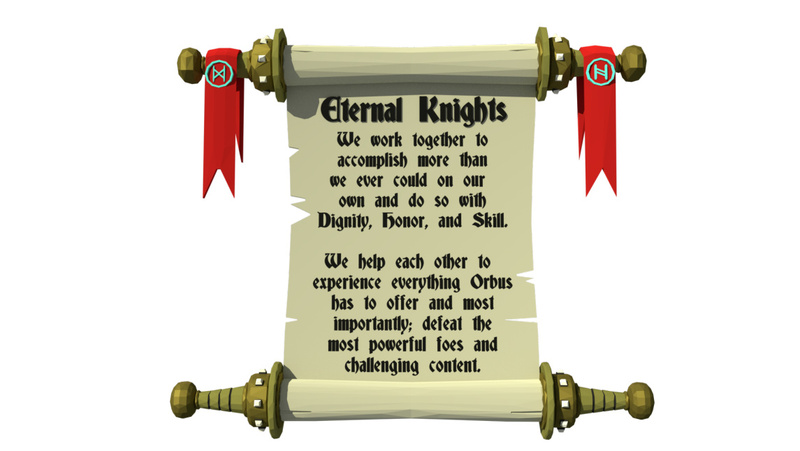 Eternal Knights is focused on collaborative teamwork without toxicity. We do not discriminate based on race, gender, sexual orientation, ethnicity, religion, nationality, HMD choice, locomotion preference, or when you joined Orbus. We value positivity, skill, teamwork and lack of egotism. We strive for a friendly, supportive environment and do not shy away from challenges or obstacles. We plan to explore and conquer all aspects of Orbus with a strong priority on end-game PVE content. At present, Eternal Knights is not open for application due to limited fellowship slots available, however we are always interested in meeting and helping new players as well as coordinating with other Fellowships on joint endeavors. That being said, if Eternal Knights sounds like a perfect fit, you haven’t found a good match with other Fellowships and you are willing to wait until we’ve managed to expand the maximum size of the guild roster, there may be some limited opportunities in the near future. (Full disclaimer: We cannot guarantee anyone on the waiting list will gain membership and may be subject to an application process at some point in the future). Members and allies alike, we look forward to fighting alongside you all in game for a long time to come! That scroll graphic gave me a nerdgasim. This is so cool man. All thanks to Chron. He draw us some amazing guild graphics. Go marry your wife and come back !